Too often women are doing amazing work, but they’re not talking about it. Why? One of three reasons. They don’t know that it’s cool, they think others wouldn’t be interested, or (worse) women don’t believe they have the expertise or authority to speak on the topic. Unfortunate, but not uncommon. Enter ELA Conf. The conference is organized by strong female leaders who are bringing together some of the most active members in the community to share their stories. The whole story, not just the success. Because the point is to help you get to the same place. The goal of ELA is for attendees to gain confidence to become leaders, speakers, and teachers in the world of tech. I have the great privilege of sharing my experience in civic tech as a panelist and a mentor for this conference. The opportunity is exciting for me because it’s a chance to share insights I’ve gained over the last 18 months that will hopefully help more women find their voices. I’m often flattered by compliments on an ability to speak comfortably and knowledgeably in front of large audiences. This wasn’t always the case, and it was positive female role models that helped me achieve greater aspirations. Let’s re-wind a bit. All the way back in July of this year, my role on the leadership team of Code for Philly was covered very nicely by one Juliana Reyes in Technically Philly. Since then we’ve gotten more attention at Code for Philly, and I’ve found myself invited to speak on the civic hacking community and its role in the city. If you didn’t know, Philadelphia is kind of a big deal in the realm of civic tech and an often-cited open data use-case because of how we release data for transparent government. So naturally people are curious about our approaches to success. The pressure to perform was high since I was representing the community as it speaks to the city at large, and in large part because I was identified as a woman leader in the tech scene. I quickly learned that there are lots of people with lots of opinions that they will happily share as constructive feedback. 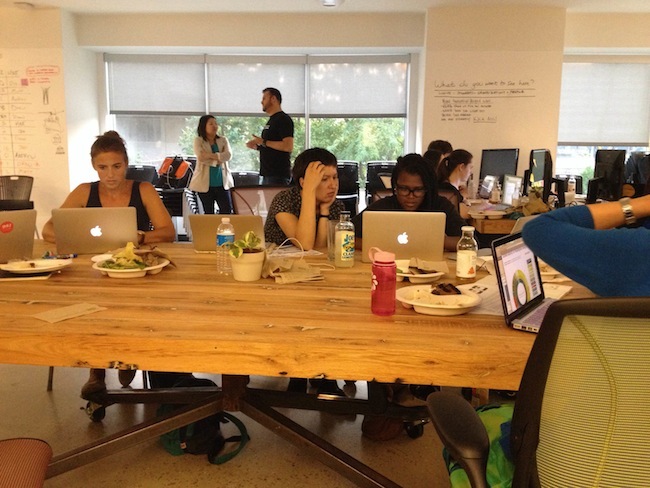 Let’s rewind again, even further to July 2014 at a Code for Philly-Girl Develop It Philly mashup called Summer of Open Source. This was my first introduction to a female-focused community. I had been attending Code for Philly for a couple weeks and because of SoOS, one of the events was a collaboration with GDI. The series brought two massive communities together for an impressive, if not overwhelming, assortment of talented professionals and civically-minded organizers. Among others, I met Corinne Warnshuis, the Executive Director of Girl Develop It. Corinne has become one of my favorite people and a personal role model. It’s not uncommon that I turn into a shameless fan girl when she’s around. She’s smart, funny, driven, creative, supportive, down-to-earth, a total goofball, and absolutely unapologetic for being herself. She leads an organization that elevates women in tech (not just in Philly but across the country) and her success comes from a place of knowing herself, being comfortable in her own skin, and valuing the person she is. She exudes these qualities, and others are drawn to that. You can see now why I want to be her when I grow up? Corinne and other inspirations from the community (not to mention a wonderful life partner) have been invaluable in navigating the unknown terrain of leadership as well as personal development. Accepting empowerment and creating it for yourself are no easy feats. Women are all too prone to self select out of opportunities to avoid rejection from someone else. That’s okay. It makes sense, but it doesn’t mean it can’t change. ELA Conf is a chance to meet amazing women who want to support you, not compete with you. Give a lightning talk or just attend. 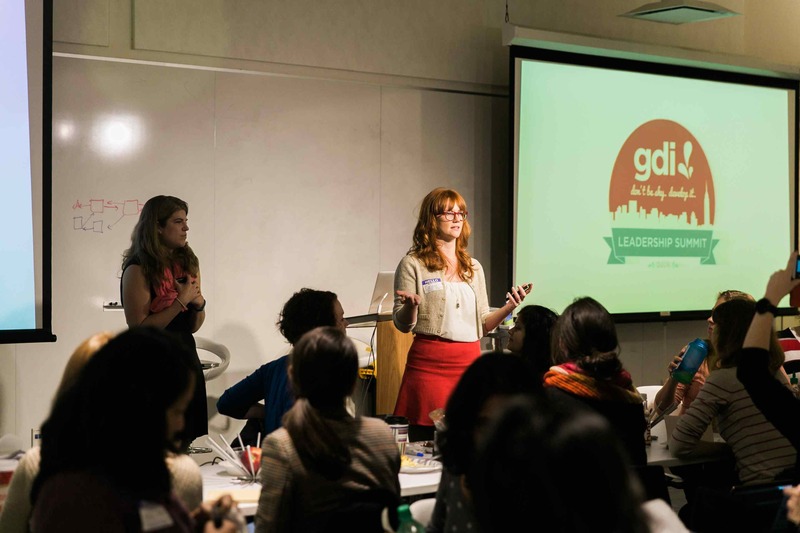 Listen to women share their stories and insights about being in tech space and being leaders. Do cool things and talk about it.